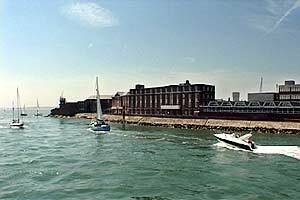 All five forts, with a supporting battery, were built between 1853 and 1863 on the western side of Gosport to protect Portsmouth harbour from an invasion force attacking from the land. They have a low profile and are disguised by earth and grass banks. They were constructed at the same time as the Portsdown and Spithead Forts and Fort Fareham. The 3 main polygonal shaped forts, all with circular keeps and 83 guns, are Fort Brockhurst, Fort Grange and Fort Rowner. Fort Elson and Fort Gomer at the north and south of the line were smaller with only 30 guns. The forts were all protected by moats, Additional small fortifications, Brown Down Battery and Stokes Bay Lines were built south-east of Fort Gomer on the coast. 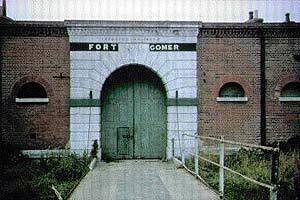 Fort Gomer, the second in the line from Fort Gilkicker, occupied the area of land that is now the Gomer Estate, on the right hand side of Gomer Lane as you head from Military Road to Stokes Bay. Building commenced in 18153 and was finished 5 years later. it could accommodate 300 men and had an armament of 73 guns. The fort was demolished in 1964,and the land bought for £169,000 by the Paige Johnson building firm to build a housing estate. The only sign that it ever existed is in road names like Moat Drive and Gomer Lane. 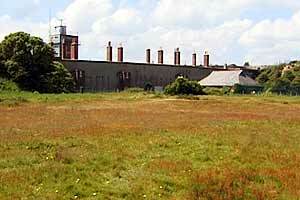 Fort Gilkicker started it's life as the Monckton Auxiliary Battery in 1856, but after four years service, a Royal Commission recommended that the battery should be extended. This was thought impractical, so a new fort was commenced in 1863, and after a few hiccups was finished in 1871 at a cost of over £61,000 and the name changed to Fort Gilkicker. It's prominent placement on the curve of Stokes Bay meant that it was in an ideal place to protect the Bay itself, as well as Browndown and the inner approaches to Portsmouth Harbour. 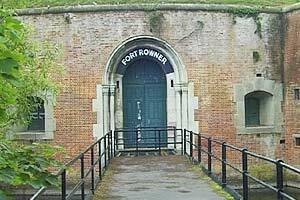 Used briefly in WW2, it was bought by Hampshire County Council in 1986..
Rowner served much of its life as an army barracks and was used to prepare troops for the Boer War. In later years it became part of HMS Siskin in 1946 and HMS Sultan in 1956. In 1991 the Degaussing Establishment moved and the fort became redundant, and is now largely unused, apart from a fishing club..
control of No.8 Group, followed by No.10 Group, No.17 Group and No.16 Group. RAF History In 1945 ,Gosport was transferred to the Navy ,becoming "HMS Siskin" who occupied the airfield until it's closure in May 1956.Aircraft from Lee-on-Solent continued to use the airfield for some months after the official closure ,but eventually even that activity finished. 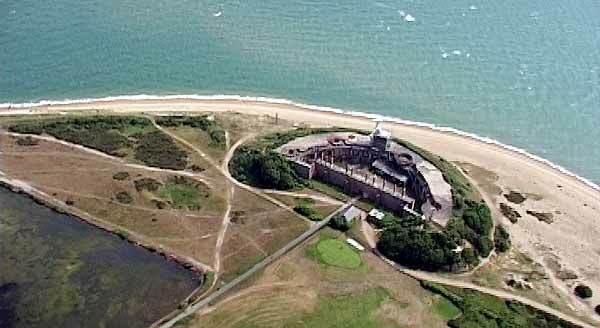 Today ,all that remains are several Hangars ,the actual field now being covered in housing estates..
Fort Blockhouse was first built on the Gosport side of Portsmouth harbour in 1495, with 5 guns. 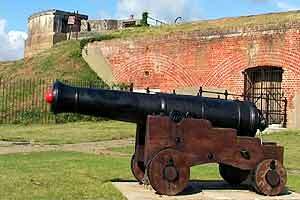 Henry VIII ordered it replaced with an 8 gun battery as part of his Device Forts in 1539. This had probably vanished by 1667 when Bernard de Gomme installed a 21 gun battery for Charles II. In 1708 the fort was rebuilt on an irregular trace. Upgrading was done at the turn of the 19th century, and again in 1845, from which time most remains date. The site was considered obsolete by the Royal Commission, and it was turned over to the Navy, where as HMS Dolphin, it has been the home of the submarine service for years. 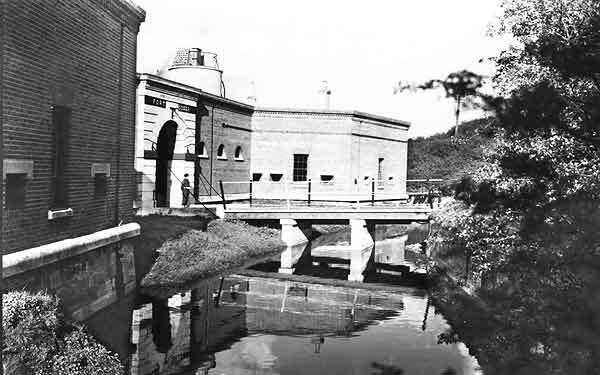 Fort Brockhurst started construction in March 1858 and was completed just before Christmas 1862, at a cost of £108,000. It could house 308 men and had 73 guns. It was the depot and headquarters for a variety of regiments from the 1900s onwards, serving as a recruitment centre and demobilisation centre in 1918. This included the 4th. Medium Regiment, the Royal Warwicks and finally 245 Armament Battery. The fort was in use by the army until 1957. It was sold in 1962 and English Heritage acquired it in 1984. It has now been refurbished as a museum and has workshops and a training facility. Fort Elson, construction started 1855 and completed in 1860 was the second of the Polygonal forts and, since the destruction of Fort Gomer in 1964, it is the oldest surviving polygonal fort. Costing £61,000 to build it had barracks for 300 and an armament of 73 guns. It is also unique in plan, this time completely abandoning the bastions of earlier fortifications in favour of earth ramparts constructed ‘en decharge’. The gorge is closed with a fortified barracks and between this and the central parade is a cavalier with positions for 6 guns. 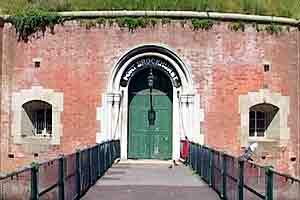 The fort closed off the northern end of the western approaches to Portsmouth harbour. A sluice connected its moat with the harbour. On the eastern side of the short connecting moat was a prepared rampart for more guns. the fort was disarmed in 1901 and was used to store torpedoes and depth charges during the Second World War. 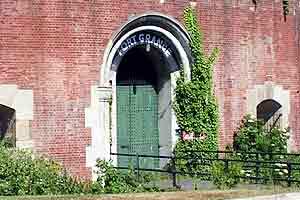 it was incorporated into the naval munitions depot of Bedenham and Frater and although no longer in use, still lies within its jurisdiction. It was surveyed by English Heritage (1990) prior to listing it. 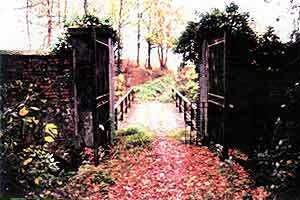 It is very heavily overgrown and parts of its tunnels and casemates are reported to have collapsed. Work has recently begun to clear its ditch and its future is unclear. Next to the westernmost of the 3 car parks on Stokes Bay, No.2 battery was built in the 1860's as part of the Gosport Defences. It mounted 15-64 pounders on traversing carriages trained both eastwards across Stokes Bay, and westwards across Browndown. It never saw action, just being used for barrage balloons and plane spotting in WWII. During the 60's the moats were filled in and it became part of a mobile home park, but recently the 3 eastern casemates have been restored to form a summer exhibition centre. My thanks to David Moore's website on the Palmerston forts which provided the text for this page. For a much more detailed history visit him and the PFS society. For detailed information on Fort Gilkicker use this link. Although Lord Palmerston built a chain of forts on land and sea to defend England's southern flanks from the French they were never used in anger.